Chronic inflammation may be involved in cancer development and progression. Using 28 inflammatory-related proteins collected from prospective blood samples from two case-control studies nested in the Italian component of the European Prospective Investigation into Cancer and nutrition (n = 261) and in the Northern Sweden Health and Disease Study (n = 402), we tested the hypothesis that an inflammatory score is associated with breast cancer (BC) and Β-cell Non-Hodgkin Lymphoma (B-cell NHL, including 68 multiple myeloma cases) onset. 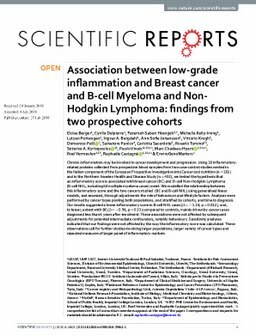 We modelled the relationship between this inflammatory score and the two cancers studied: (BC and B-cell NHL) using generalised linear models, and assessed, through adjustments the role of behaviours and lifestyle factors. Analyses were performed by cancer types pooling both populations, and stratified by cohorts, and time to diagnosis. Our results suggested a lower inflammatory score in B-cell NHL cases (β = -1.28, p = 0.012), and, to lesser, extent with BC (β = -0.96, p = 0.33) compared to controls, mainly driven by cancer cases diagnosed less than 6 years after enrolment. These associations were not affected by subsequent adjustments for potential intermediate confounders, notably behaviours. Sensitivity analyses indicated that our findings were not affected by the way the inflammatory score was calculated. These observations call for further studies involving larger populations, larger variety of cancer types and repeated measures of larger panel of inflammatory markers.